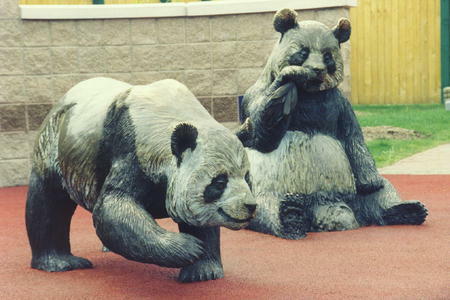 These two 'Giant Pandas' are located near the main entrance of the Toledo Zoo. The sculptures are cast bronze, and the sitting Panda is under four feet tall, the walking Panda is over two feet high. The plaque on this sculpture reads: "These statues commemorate the historic visit of the Giant Pandas, Le Le and Nan Nan from 5/24/88 to 10/25/88. and celebrate the friendship between the Peoples Republic of China and the Toledo Zoo". "Nan Nan (female) was born approximately in 1981. She was named after the area where she was found, Nanping. She died on January 16, 1993 in Wolong. Le Le (male) was born approximately in 1983 His name means "happy" in Chinese. He died on June 5, 2000 in Wolong." : “Giant Pandas,” Ohio Outdoor Sculpture Inventory, accessed April 22, 2019, http://oosi.sculpturecenter.org/items/show/440.